It's deeply frightening and upsetting how politically divided society is at the moment. When different factions are so convinced about the certitude of their own ideas and beliefs conflict is inevitable. Religion continues to be at the centre of many battles, yet in her new novel Elif Shafak creates the character of A.Z.Azur, a controversial Oxford professor who encourages dialogue across religious belief systems as he believes that too many people suffer from what he calls “The Malady of Certainty”. Every term he holds a selective seminar whose sole purpose is to probe the philosophical meaning of God. However, at the centre of this story is Peri, a highly intelligent Turkish woman who is confused about what God means to her. Enrolled in this seminar alongside her are friends Shirin, a bisexual woman with an Iranian background who considers herself “as British as a treacle tart but as out of place as a stuffed date cake” and Mona, a politically-engaged woman of Egyptian descent who is an ardently devout Muslim. These three women are referred to as “the Sinner, the Believer, the Confused.” They are individuals caught in a state of flux between different nations, faiths and ideologies. Shafak creates a deeply meaningful, extremely relevant and riveting tale about the role belief plays in these modern women's lives. The novel opens on a typical day in 2016 when Peri is living as a mother in Istanbul driving with her daughter to a high-class dinner party. It's been over fifteen years since she studied at Oxford and the life she's settled into is very different from her idealistic university years in England. She and her husband socialize with powerful businessmen (some of whom are involved in dodgy deals) and an image-conscious class of women who “paraded their handbags like trophies won in faraway battles.” When caught in traffic Peri puts her own handbag in the backseat where it's stolen by a thief. Rather than accept the loss, she decides to do something drastic about it and this sets off a chain of events that prompt her to take action in life. The narrative switches back and forth between this extraordinary day and the back story of Peri's life. It recounts the sharp ideological divides which existed in her family home between her devout mother and non-practicing father as well as her elder brother Umut who is a Marxist targeted by the government and younger brother Hakan who is an “irredeemably religious and excessively nationalistic” journalist. Endearingly, Peri escapes from the dramas of her household by voraciously reading because she “found solace in literature… Books were liberating, full of life.” This leads her to do exceedingly well in school and secure a place studying at Oxford. At the heart of the novel is Peri's quest for answers to irresolvable questions about her identity and faith. She's haunted by a jinni or spirit in times of distress which takes the form of a child's face. There is a dark truth about her past which she can't surmount and move on from despite trying to fashion a new future at university. A dramatic event in Oxford causes her to abandon her progressive life there and settle into a more traditional role as a wife in Istanbul. This is very different from how she envisioned her life, but she's not blind to the contradictions and hypocrisy of the society around her – especially those who are zealous in their nationalism and religion. Humorously she observes that “There were plenty of people who fasted during Ramadan both to renew faith and to lose weight. The sacred dovetailed with the profane.” The inequality between men and women remains a particular concern where she wonders “Was religion an empowering force for women who otherwise had limited power in a society designed for and by men, or was it yet another tool for facilitating their submission?” Peri desires to proudly be an active part of her faith and homeland without submitting to the oppressive dictums of those in power. It feels particularly important to read dynamic and complex portraits of Muslim women's lives right now. 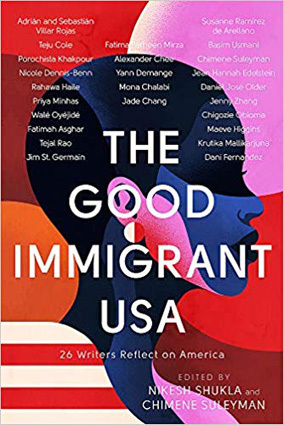 Considering that the US has just enforced a policy temporarily blocking border entry for anyone from specific Muslim-majority countries, reading about the perspectives of Muslim lives prevents them from becoming a faceless other. I related to a lot of the specific and general conflicts Peri faced in this story despite her background and life being so different from my own. Elif Shafak writes a wonderfully immersive story with complex, nuanced characters. Irrespective of the current political climate, this is a compelling and accomplished novel in its own right. But I particularly admire how this novel and others such as Chinelo Okparanta's “Under the Udala Trees” and Ali Smith's “Autumn” address the current political climate of their societies and artfully suggest practical ways to create dialogue between fractious groups. “Three Daughters of Eve” is an original and memorable story.